Staying in shape in your 50’s can be challenging but it’s definitely easier than getting in shape. So there is this thing called sarcopenia, which means muscle loss. It occurs with aging in adults over 30 regardless of whether they are active but apparently those who exercise may not feel as much of its effect, since exercise is one of the ways to fight sarcopenia and prevent muscle loss. Losing between 3 and 5 per cent muscle mass each decade since your 30’s can turn out to be detrimental to your appearance and strength. Besides inactive people who don’t control their eating will gain excess fat in place of lost muscle. But it’s not only about the looks. Physical fitness decreases with muscle loss and sarcopenia can also lead to weakness and lack of stamina. Bone loss can also occur in women during menopause. So as these two progress people who are inactive can experience problems with healing and recovery after traumas, and slow metabolism. 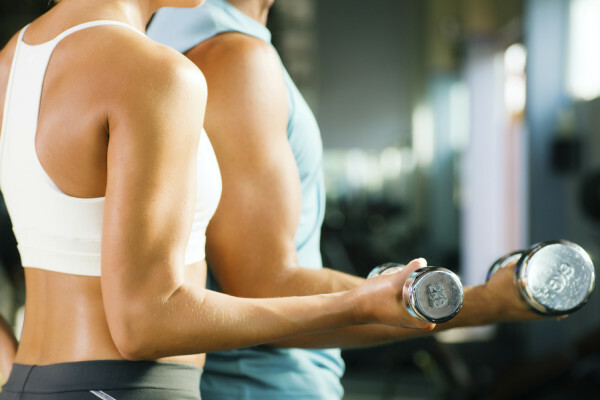 One of the best ways to fight sarcopenia is strength training. Any time is the best time to start. Researchers don’t know for sure what causes sarcopenia but they have a few theories. One of those theories has to do with the hormone level in aging adults. Since hormone concentration decreases with age certain anabolic hormones like testosterone and growth hormone can decrease as well. Another thing that could lead to muscle loss is purely dietary; insufficient calorie/protein intake can help sarcopenia develop. Or it could be that our bodies stop producing enough protein or nerve cells that are responsible for movement. Any way, strength training can help you build muscle and maintain the optimal mass for performing everyday tasks without much effort. Besides, the more you move and better you eat, less excess fat accumulates in the body. You will look and feel as strong as in your 30’s. This entry was posted in News and tagged strength training. Bookmark the permalink.